Humans and drones working together for the greater good of humanity – an increasing occurrence witnessed in today’s disaster recovery efforts. In 2016 with Hurricane Matthew, insurance and telecom companies such as Allstate and Verizon, relied upon drones to assess damage of critical infrastructure. In order to determine connectivity and damage, the telecom company, Verizon, used a drone throughout parts of North Carolina that experienced severe flooding to inspect cell towers. In Savannah, Georgia, a blog post reveals how Allstate relied on drones to survey property damage caused by the hurricane. This year, hurricanes Harvey and Irma, present another scenario where drones are being utilized to serve in disaster recovery efforts as useful recovery tools. To paint a picture of the economic costs, an article from Miami Herald cites that the damage caused by Irma is expected to reach $18 billion in the U.S.
En route to Florida, Hurricane Irma left thousands of people homeless, and in some cases, similar to the earlier incident with Harvey and Texas-based chemical plant, Arkema, others have been exposed to harmful chemical substances from large refineries wiped out by the hurricane. Determined to restore order on the ground, emergency management teams and first responders have been hard at work, utilizing drones to give them an aerial perspective by capturing data, enabling key decision makers to take action. Leading the response is FLYMOTION, a drone company based in Tampa, Florida, providing end to end solutions, services and training. They have been actively involved, deploying 22 aircrews across Florida to limit the effects of Hurricane Irma. FLYMOTION en-route, equipped with their mobile command center and staff vehicles. To learn more about best practices and his experience on the frontlines, we caught up with FLYMOTION’s CEO & Co-founder, Ryan English, to share his insights on how drones are being used to alleviate the devastating effects caused by Irma. How did you first get involved with drones in public safety? My business partner and myself, combined, have more than 30 years in public safety including fire rescue, law enforcement, special operations and serving in the U.S. Coast Guard. During that time, an increasing number of our operations could have benefited from the utilization of drone technology, which would completely change the tactical approach of an incident. Once we became familiar with the technology, we began working with numerous agencies around the country to show them the many benefits of drone technology, and how it could revolutionize the way they conduct scene calls, emergency operations and more. The FLYMOTION team has continued adding new team members to assist with the growing number of agencies and organizations we support across the country. What type of clients are you typically serving? We typically work with Public Safety Agencies including law enforcement, fire rescue, and emergency medical services. We also work closely with the Department of Defense in addition to numerous energy companies, utility providers, private corporations and more. Since Irma first struck Florida, how many missions has your team conducted? During the initial response, FLYMOTION UAS teams conducted over 500+ missions and as the recovery process continues we have now flown over 650 missions which is increasing daily while covering over 300+ miles of hurricane-damaged terrain. The FAA worked closely with us to ensure these missions were properly authorized and they were very accommodating. There is a lot of discussion within the industry about how drone teams can best collaborate with the established incident command systems, how did your team cooperate with the Irma response command systems? The incident command system is something we have personally been working around for many years in the public safety community before FLYMOTION even existed, so this is ingrained in our daily operations. We worked with numerous operation centers and were able to relay the information we gathered back to them for analysis. When reporting back with data to the individual entities, what kind of meaningful results are being captured to help them respond effectively? Primarily we were tasked with assessing damage of critical infrastructure so the most important thing is letting them see what’s going on in the field. The imagery provides the most up to date and near real-time experience for the incident commanders. To achieve this, we utilized a cloud-based server upload system that we then leveraged to catalog the imagery. What recent advancements in drone technology are helping you to serve your clients’ needs under such critical circumstances? The sensors, especially with long range zoom and thermal imaging capabilities, were utilized extensively during these operations. Also, being able to rapidly deploy a UAS is a significant benefit to our clients. With that said, having a rugged platform like the M200 Series that can fly in adverse weather conditions was ideal. What are some of the key lessons and challenges you faced throughout this mission, and how did you overcome them? Pre-deployment is key, especially if you know the disaster is imminent. Making sure you have redundant drone systems, batteries and accessories. We were able to significantly streamline the restoration process of critical infrastructure, and drone technology is what allowed that. 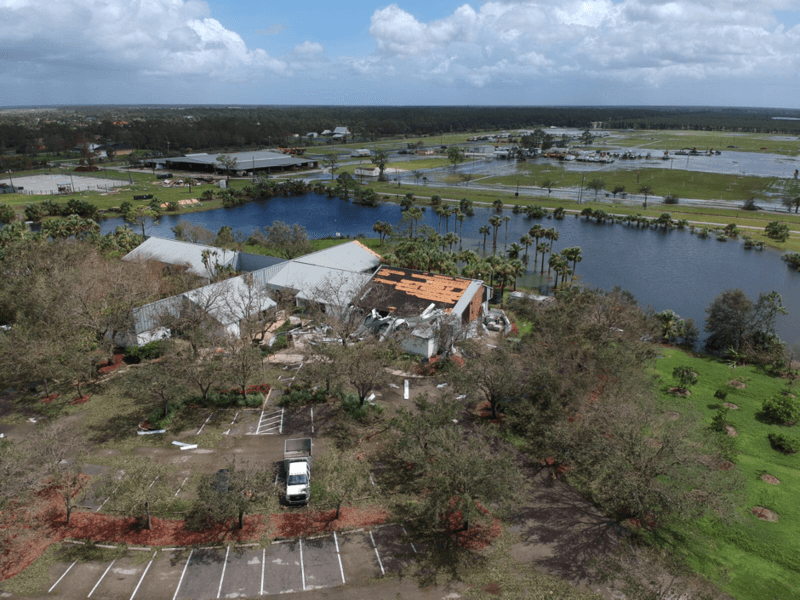 Our UAS teams were spread throughout Florida, so the biggest challenge was communications as the wireless infrastructure was severely impacted in several areas we were operating in. We were fortunate to have our vehicle-based satellite systems on our command center as well as portable satellite systems that were there as needed. Also, our Mission Case™ provided a dedicated LTE network for our team communications. Are there any last comments you would like to share? “Riding out the storm gave us a sincere appreciation of what people experienced and went through in these communities. If you want to learn more about Ryan or FLYMOTION, and get connected with other key players in the commercial drone space, then join us at AirWorks on November 7th 2017. For more details about AirWorks and the event, click here.